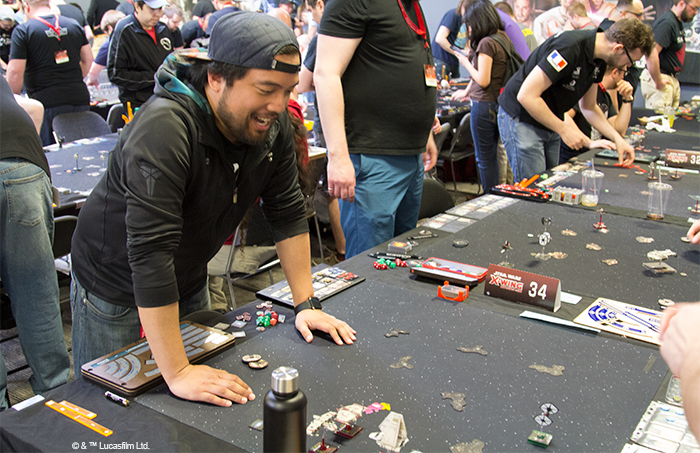 This October 5th – 7th, X-Wing™ Second Edition will make the jump to hyperspace with the 2018 Coruscant Invitational—the first major competitive event for the game's second edition! 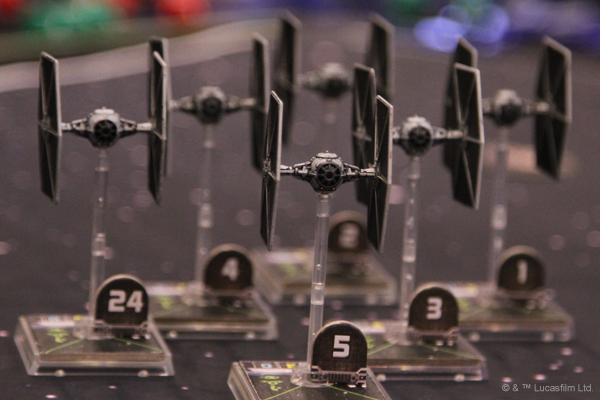 The culmination of the 2018 X-Wing System Open Series, the 2018 Coruscant Invitational promises to draw hundreds of squadron leaders from across the globe for their first shot at top-level second edition tournament play. They'll come with new squads for the Rebels, Imperials, and Scum and Villainy, eager to prove their skills in a game that reinforces the importance of clever maneuvering and a strategic use of actions. 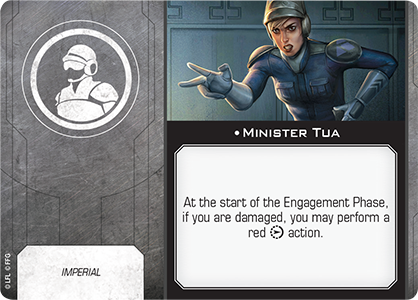 And while we won't know everything these players will have in their squads, we'll know at least one thing in advance—each attendee at the 2018 Coruscant Invitational will need to incorporate one at least one copy of his or her faction's "essential" upgrade. 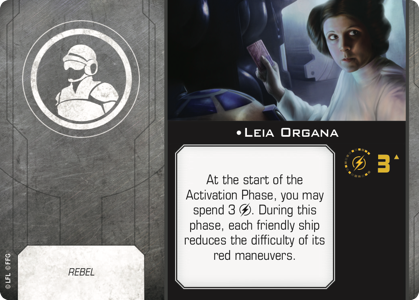 Last week, we opened the voting for the essential Rebel upgrade, and you decided that each Rebel player needed to play with at least one copy of the Leia Organa crew upgrade . 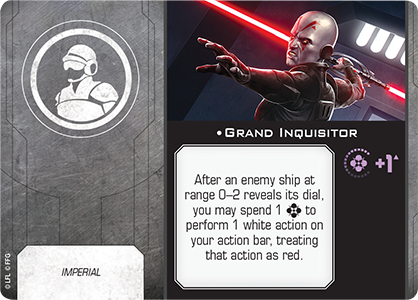 Today, we turn our attention to the Imperials, again asking you to help us determine, "What is the essence of the Imperial Navy in X-Wing?" The Galactic Empire used fear and intimidation to exert its tyrannical influence over countless star systems. This required the maintenance of a vast military force, of which the Imperial Navy was a major component. At the height of the Empire, the Imperial Navy boasted more than twenty-thousand Imperial-class Star Destroyers, each of which boasted enough firepower to make its arrival in a system a notable event—one to embolden the Empire's allies and dissuade would-be dissenters. Additionally, these Star Destroyers frequently carried small armies and dozens of nimble TIE/ln fighters, which they could deploy at any sign of enemy activity. The design of these TIE/ln fighters favored economy over durability. Given the constant stream of new recruits from thousands of worlds, the Empire enjoyed a steady influx of new talent, and its Academies turned out pilots trained in the Empire's favored swarm tactics, taught to ignore their own well-being in favor of completing their missions. The mass-produced TIE/ln fighters were perfect for these untested and unproven pilots who might have proven a risk in more expensive craft. And while their fighters lacked shields and were relatively fragile, these Imperials were frequently able to overwhelm better armed and better trained enemies simply due to sheer numbers. 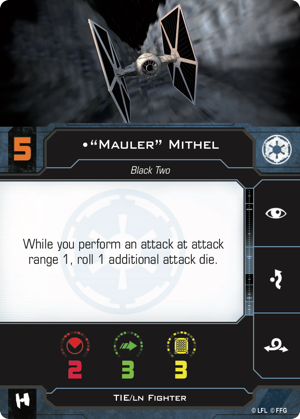 Of course, the Empire had plenty of resources and ambition to develop more advanced fighters, as well, and though these weren't produced on anything near the scale at which the TIE/ln fighters were produced, the TIE/d defender and Darth Vader's TIE Advanced x1 offer two excellent examples of superior Imperial engineering. These deadly fighters were easily a match for any of the Rebel designs of the same time. Just as in the Star Wars canon, the Imperials in X-Wing are defined by their vast numbers, their extraordinary resources, and their fantastic, tyrannical ambitions. Players can field swarms of TIE fighters or invest in more experimental and powerful craft such as the TIE Advanced x1 or the TIE/ph phantom. 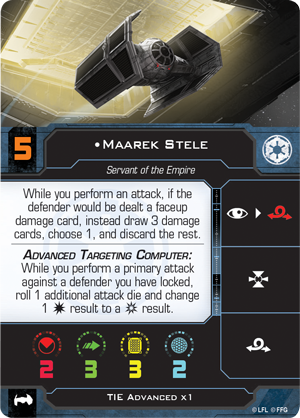 Likewise, the field of Imperial pilots runs straight from the newly recruited Academy Pilot all the way to aces like Maarek Stele , "Mauler" Mithel , and Darth Vader . Narrowing the contents of the Galactic Empire Conversion Kit to one essential upgrade is no easy feat. In addition to its bases, pegs, and punch, the Galactic Empire Conversion Kit contains 248 cards—two condition cards, 93 ship cards, and 153 upgrades. Of these 153 upgrades, seventeen serve the Empire loyally, refusing to work with the Rebel Alliance or the galaxy's Scum and Villainy. Breaking these seventeen upgrades down even further, we find two title upgrades, one gunner, ten crew (one of which occupies two crew slots), and three copies of the talent, Ruthless. 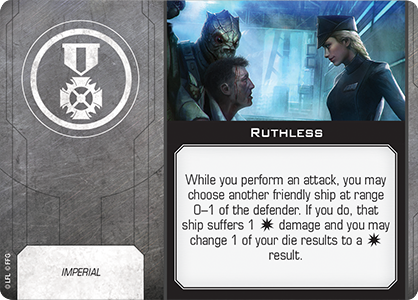 Exemplifying the Galactic Empire's willingness to overcome resistance by way of numbers and attrition, Ruthless allows your aces to force damage on their opponents by dealing damage to their wingmates. And while damaging your own ships might seem dirty or, at the least, somewhat counterintuitive, these are exactly the sort of tactics you might expect from an Imperial squadron that might outnumber its opponents by a margin of two to one. The additional offense provided by Ruthless is obviously the talent's main draw, but there's a secondary benefit, as well—one that aces like "Howlrunner" and "Scourge" Skutu are certain to have recognized. 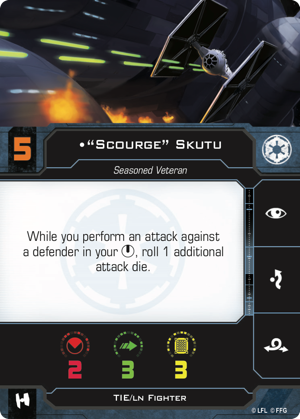 By pumping a bit of damage into an Academy Pilot or two to cripple or destroy one of your enemy's ships, you make that Academy Pilot a more tempting target for retaliatory fire, and as your aces would have noted, each shot directed toward an Academy Pilot is one less shot fired at your aces. 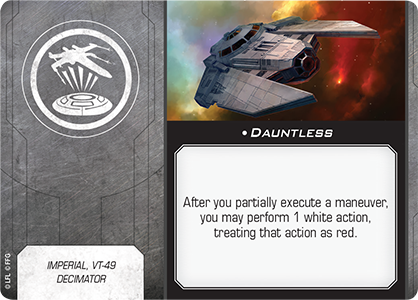 While both the Dauntless and ST-321 title upgrades add interesting options to any squadron that incorporates them, they are each restricted to just one ship, and for that reason, we're opting not to include either of these cards in our vote. On the other hand, the sole Imperial-only gunner upgrade in the Galactic Empire Conversion Kit will be able to play on any of five different Imperial ships immediately upon the launch of second edition. This makes Fifth Brother an interesting way for you to add a point of Force capacity to ships like the VT-49 Decimator, TIE/ca punisher, and TIE/sa bomber that enter second edition with a gunner slot but no pilots capable of using the Force. 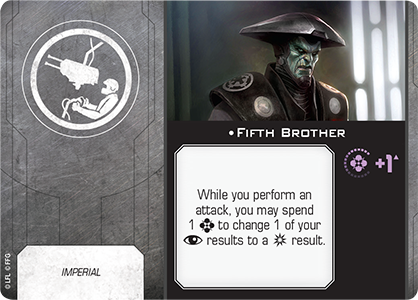 Given the newly centralized importance of the Force in X-Wing Second Edition, the versatility that he lends a wide array of Imperial starships, and the increasingly prominent role the Order of Inquisitors has been playing in materials like Star Wars: Rebels and the Darth Vader comics, Fifth Brother stands as an excellent option for any Imperial fleet—especially one looking to dig into the Galactic Empire's origins and the dark side of the Force. With two of our four options for the vote already selected, we turn to the difficult task of selecting our last two options from the ten crew included in the Galactic Empire Conversion Kit. These include such notable characters as Moff Jerjerrod, Seventh Sister, Minister Tua, the Grand Inquisitor, and Agent Kallus, as well as the Dark Lord of the Sith, Darth Vader. However, name recognition is only part of what makes an upgrade "essential," and the vast military machine of the Imperial Navy consisted of countless pilots, crew, and officers, many of whom played fantastically important roles, even if those roles didn't feature as prominently in the conflicts featured in the original Star Wars trilogy. 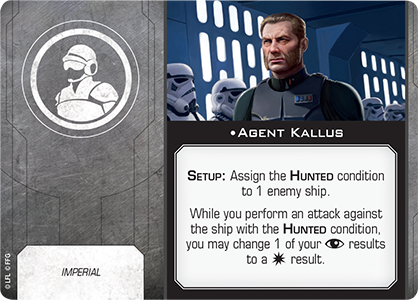 A couple such officers appear in the Galactic Empire Conversion Kit with abilities that almost perfectly embody the Imperial Navy's tactics, translating to two abilities that lead to wildly different gameplay options. Ciena Ree was a pilot who rose through the ranks to eventually command a Star Destroyer, the Inflictor. 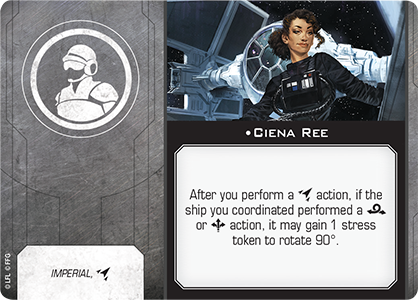 In X-Wing, Ciena Ree's crew card combines her love of flying with her leadership skills. 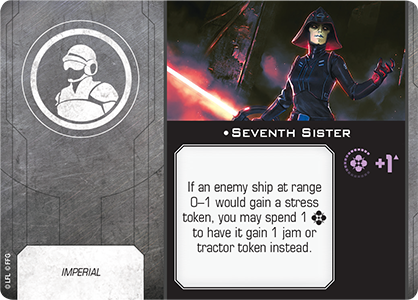 When her ship performs a coordinate action, if the allied ship performs a boost or barrel roll action, Ciena Ree lets it gain a stress token to rotate 90 degrees. Because Ciena Ree's ship will coordinate on its initiative, this ability could mean that she allows a lower initiative pilot to change its facing or set up an ace pilot for a speed-one or speed-two turn that might catch an opponent completely by surprise—after that enemy thought it had flown out of the ace pilot's firing arc. Meanwhile, Admiral Sloane was another human female, like Ciena Ree, whose drive and talent saw her rise swiftly through the Imperial ranks. Thanks to the fact that her first experience with the Galactic Empire was when it drove out her world's criminal groups, she saw the Empire as a force for good in the galaxy—one that brought law and order. Her commitment to this cause served her well as she unraveled several conspiracies fueled by corrupt Imperials, and she was largely responsible for the Empire's survival after the Battle of Endor. Even though Admiral Sloane understood the need to use force and harsh tactics to crush her enemies, she was no proponent of squandering the lives or resources at her command. In the end, it was her decision to retreat from Endor that held the remaining Imperial forces together and allowed for the eventual construction of a new Empire, which would become the First Order. 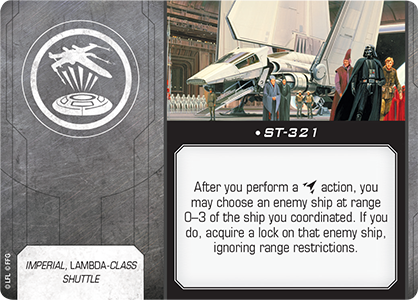 In X-Wing Second Edition, this driven and visionary officer is represented by a crew upgrade that ensures your squadron's losses are never in vain. 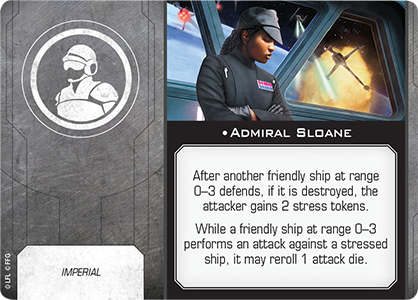 Whenever a friendly ship at Range 0-3 is destroyed, Admiral Sloane assigns two stress tokens to the attacking ship, limiting its ability to respond to your squadron's ensuing maneuvers. Simultaneously, she enhances your squadron's offensive power, granting all friendly ships at Range 0-3 the ability to reroll a dice while attacking a stressed enemy. Along with her commitment to the Imperial cause, this ability—which fits perfectly into any swarm strategy—makes Admiral Sloane a fantastic representative of the Galactic Empire within the game, one we're happy to add to our shortlist of "essential" Imperial upgrades. With only one spot left on our shortlist, we feel compelled to provide Grand Moff Tarkin an honorary mention. Easily one of the most pivotal figures in the Galactic Civil War, Grand Moff Wilhuff Tarkin was responsible for the Tarkin Doctrine and the Tarkin Initiative, an Imperial think tank that developed much of the work behind the construction of the Death Star. He was responsible for using the Death Star to destroy the planet of Alderaan, believing that this demonstration would lead the rest of the galaxy to fear and obey the Empire. 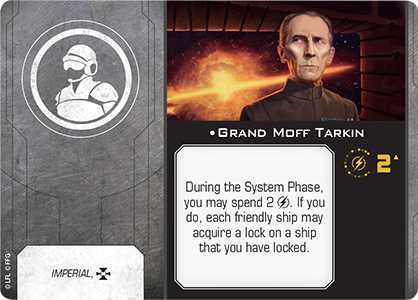 In X-Wing Second Edition, we find Grand Moff Tarkin's crew card reflects his beliefs in shows of power and the ability to rule through fear. Grand Moff Tarkin comes with two charges. By spending these charges during the Systems Phase, he allows each friendly ship to acquire a lock against a ship that his ship has locked. While those friendly ships still need to be at Range 0-3 of the ship they're locking, Tarkin's ability lets them acquire the locks even if they can't normally perform the lock action. In this way, Tarkin can single-handedly transform a swarm of Academy Pilots into a singularly accurate strikeforce—and those TIE pilots don't even need to take an action to get their locks! Still, despite Tarkin's prominence in the Galactic Civil War, and despite the fact that he can potentially lead your squadron to frighteningly lethal bombardments every other round, the Grand Moff is ultimately trumped by his superior, Emperor Palpatine. The Sith Lord responsible for the downfall of the Republic and the rise of the Galactic Empire, Emperor Palpatine was powerful enough to keep his ambitions secret from the Jedi Council even as he manipulated events throughout the galaxy. He engineered whole political crises, played factions against each other, destroyed the Jedi, seduced Anakin Skywalker to the dark side, and duped the Republic Senate into granting him the powers that would later allow him to reshape the Republic as the Galactic Empire. 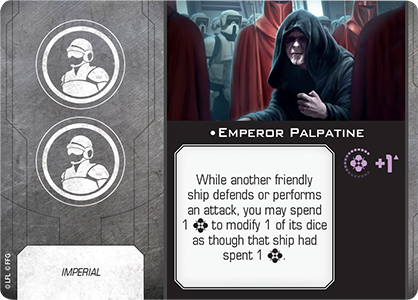 As a crew upgrade in X-Wing, Emperor Palpatine lends your squadron similarly far-reaching powers. First of all, he adds a point of Force capacity to any ship transporting him, but the Empreror isn't just any Force user. 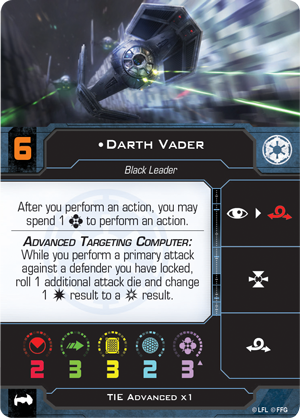 He's arguably the most powerful individual in the galaxy, and he can use his Force powers to alter the fate of any ship in your squadron, regardless of its position. Even from the opposite side of the battlefield, Emperor Palpatine could convert one of Darth Vader's focus results into either a hit or an evade. Or, if he saw that Vader was going to evade his attacker even without his interference, Emperor Palpatine could wait to see if another friendly ship might benefit from his assistance. 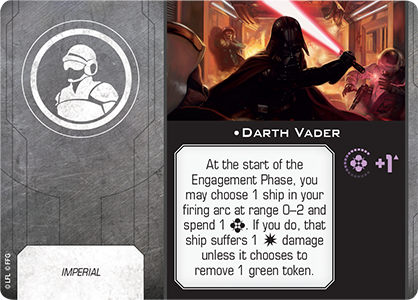 And because the Emperor's ability allows you to react to the dice on table, it frees you to think about your other ships' actions differently. 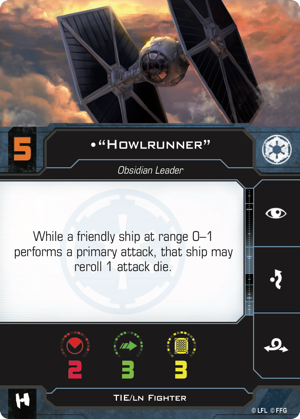 In most situations, a focus token might be more useful than an evade token, but when you have the Emperor on the table, a pilot like "Howlrunner" might perform the evade action, knowing that the evade token could modify a blank result and the Emperor could modify a focus result. 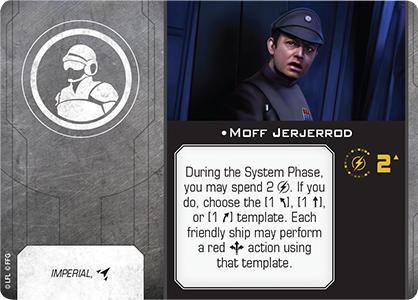 Similarly, the Emperor's ability to interfere on your other pilots' behalf can make it easier to decide whether or not to spend a focus token to modify your attack, knowing that you can modify one of your attack dice with the Emperor's ability and save your focus tokens to modify your defense dice. 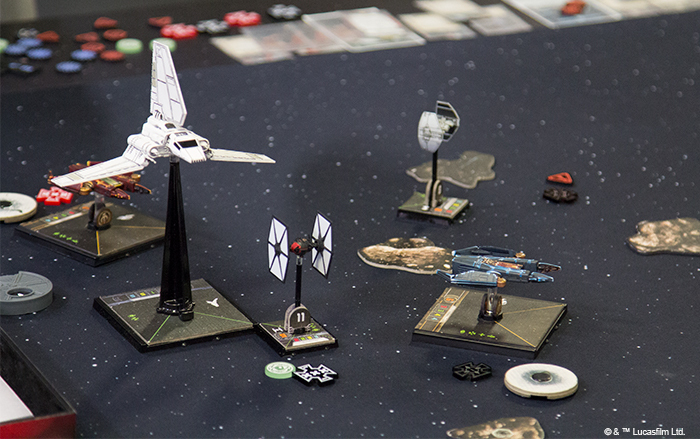 What truly defines the "essence" of the Galactic Empire in X-Wing Second Edition? Is it the leadership? Is it the sheer size of its military force—one comprised of countless pilots, crew, and officers, all committed to the same cause? Do we find the Navy best represented by its ships and the upgrades that most accentuate their capabilities? Are we united behind some Ruthless Imperial spirit? Do we want to see the Empire using its numbers to its advantage, getting as much as possible from each sacrifice in a war of attrition? 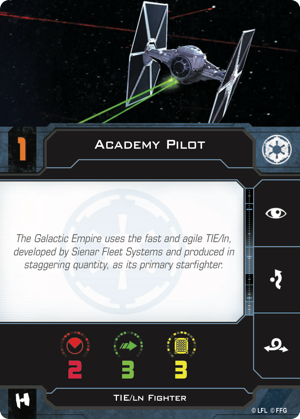 With its renewed focus on faction identity, X-Wing Second Edition promises to introduce plenty of unique game elements that feel truly "Imperial," but choosing the upgrade from the Galactic Empire Conversion Kit that best represents the "essential" Imperial experience? That's up to you! Find us on Twitter @FFGOP now to cast your vote for the "essential" Imperial upgrade. We'll share the results next week when we return with a look at the Scum-only upgrades from the Scum and Villainy Conversion Kit!